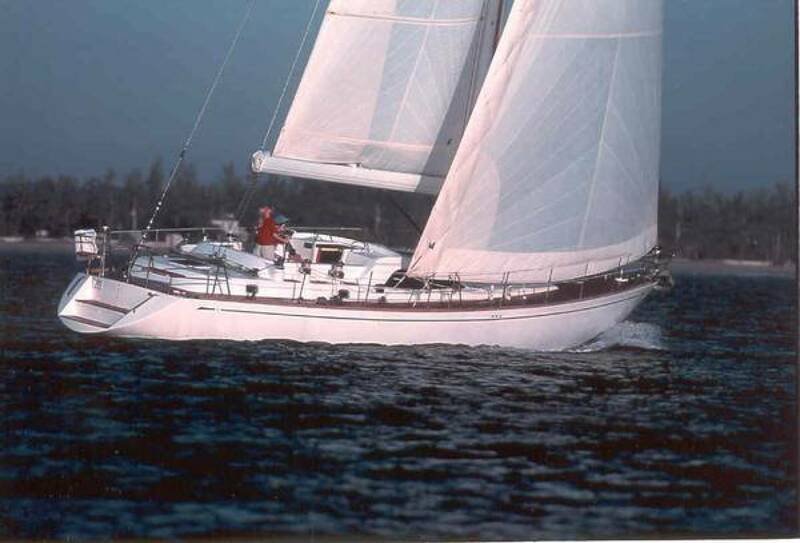 The Stellar 52 Center Cockpit LADY MINA was named Boat of the Year in the Deck Saloon/Pilothouse category by Cruising World magazine in 2002 at Annapolis Show. The 52's styling, interior design and joinery, systems, hardware, rigging and equipment were praised as comparable to competitors costing up to twice the price. LADY MINA is well equipped for cruising with all the luxury builder options including Leisure Furl stowboom, generator, reverse cycle AC, 4 electric winches, and state-of-the-art electronic package. This year a new 8 kw generator was installed. LADY MINA's design pedigree features the work of Sparkman and Stephens as well as West Coast designer Bob Perry. She sails well in all conditions and offers a sea kindly motion and excellent directional stability in heavier offshore weather. There is a stepped transom/swim platform, and large comfortable cockpit with excellent visibility from the helm. Below is a luxurious three stateroom interior arrangement featuring a bright, airy raised salon with two comfortable top grain leather seating. On deck is a spacious cockpit with excellent 360 degree visibility from the helm. The exquisite cherry woodwork and quality construction and systems are the work of her experienced builder Grand Harbor. LADY MINA is ready to go to sea. She has made 6 roundtrips from Hilton Head to Cape Cod, crossed the Atlantic and pulled into 40 ports in France and Italy. 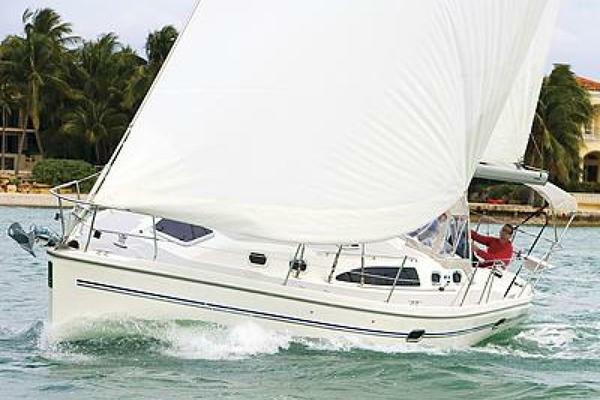 Falmouth Yacht Sales would love to guide you through a personal showing of this 52' Stellar 52 Raised Saloon 2002. This yacht for sale is located in Hilton Head, South Carolina and priced at $349,000. For a showing please contact us by filling out the form on this page and we will get back to you shortly! The navigation center is aft of the port salon seating and includes built-in console for electronics and AC/DC electric breaker panel and a comfortable upholstered seat. The deck also works well as a ship's office. The galley is in the starboard passageway and includes front loading refrigeration and deep freezer. There is an inboard counter with double stainless sinks and storage lockers. Outboard is the gimbaled stainless stove with oven and additional counter space. All counters are Corian and have lockers above and below. The master stateroom is aft and features a centerline queen with seating area adjacent to starboard of the birth. There are hanging lockers, numerous drawers and additional locker space to port opposite the seat. The ensuite head has separate stall shower. Interior Highlights: Custom cherry interior (light South American cherry for vertical bulkheads and doors with darker American cherry for frames and moldings). All joinery work is of yacht quality finish with either gloss or satin finishes. Salon window shades and designer leather fabrics for all seating areas. Main salon headliner and under deck lights have dimmer controls,custom push button latches for all doors and drawers. Porcelain sinks in heads. Panasonic 15" flat screen television and DVD. Five Hella turbo 12 volt fans. New custom made bed and pillow covers. Yanmar 85 hp diesel (4JH2-UTBE). Grohe fixtures; all copper fresh water piping; Forespar Marelon through hull fitting valves that do not require bonding; 110 volt and engine water heater. Three-bladed Max Prop feathering propeller 21"
12 Volt DC and 110 volt AC electric systems with breaker panels; Copper grounding strips running full hull length connected to external Zinc anodes; complete bonding system. Hand lay up, solid hull construction with longitudinal stringers per side for additional stiffness. Hull scantlings in excess of ABS offshore standards. Vinylester resin used in three outer laminations improving water resistance and layers of E Glass reinforcement are incorporated for added strength. Internal lead ballast. Watertight bulkheads fore and aft. Hull below water line has gel shield treatment. Massive solid bronze skeg for rudder protection. The inward-turning integral hull flange provides a well-protected shelf to which the deck is mechanically fastened and laminated. The long, low-aspect-ratio shoal fin keel is flared at the base and made of the same material as the hull. The thick FRP laminate encapsulates 12,000 pounds of lead ballast. The rudder is protected by a full length skeg. Deck is fiberglass balsa sandwich construction for stiffness and insulation. All areas of the deck with through bolted fittings are solid laminates with backing plates. Teak decking including side decks, cockpit seating and cockpit floor. 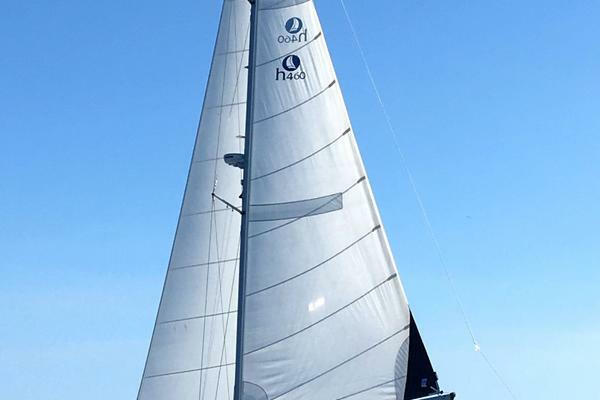 Forespar keel stepped aluminum painted mast with double spreaders; four internal halyards; oversize 1 x 19 discontinuous wire rigging w/Norseman fittings; Navtec stainless steel turnbuckles. Spinnaker equipment package including mast mounted pole, all blocks, halyards and custom bow and tack control. Wichard quick adjusting inner forestay connection. LADY MINA is one of the strongest, best finished contemporary semi custom raised salon yachts listed for sale. She is fast, set up to sail shorthanded and offers an exceptionally good motion at sea. Sparkman & Stephens designed her for extended passagemaking and comfortable liveaboard. LADY MINA has all the luxury yacht systems including generator, reverse cycle A/C, Leisure Furl stow boom, and watermaker.